Item Description: Entry, dated 22 March 1863, from Margaret Ann “Meta” Grimball’s diary describing the effect of blockade running on the local economy. 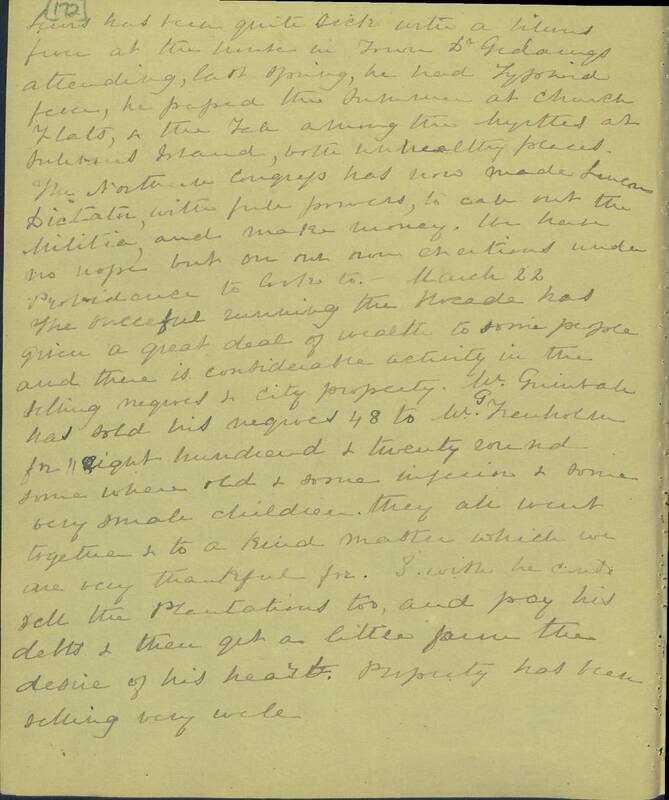 Grimball notes that her husband has sold his slaves, but remains in debt. From the Margaret Ann Meta Morris Grimball Diary, Southern Historical Collection, Wilson Library, University of North Carolina at Chapel Hill. The successful running the blocade has given a great deal of wealth to some people and there is considerable activity in the selling negroes & City property. Mr Grimball has sold his negroes 48 to Mr G. Trenholm for eight hundred & twenty round some were old & some inferior & some very small children. They all went together & to a kind master which we are very thankful for. I wish he could sell the Plantations too and pay his debts & then get a little farm the desire of his heart. Property has been selling very well. More about this item: Margaret Ann “Meta” Morris Grimball was the wife of John Berkley Grimball (1800-1892), rice planter of Saint Paul’s Parish in the Colleton District of South Carolina. This entry was posted in Southern Historical Collection and tagged blockade running, Meta Morris Grimball, slaves, South Carolina, Spartanburg. Bookmark the permalink.